As we were studying and planning for our trip of a lifetime, we had occasional discussions about the city of Dawson Creek. It seemed to be almost a magical waypoint – so far away! But here we are now, 1,628 miles and several months from Tracy, CA. Dawson Creek is centrally located between four highways; the Alaska Highway (97 N), the John Hart Highway (97 S), Highway 2 and Highway 49 (to Alberta). 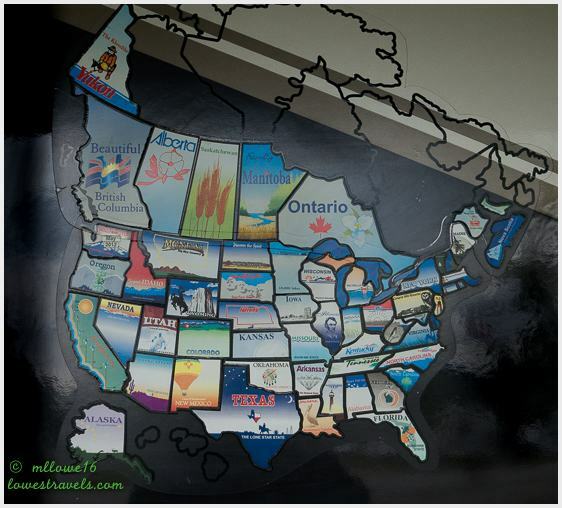 It is also known as Mile 0 of the Alaska Highway. The image below was typical of one we would see for “Mile 0”, and now we were here! What about Mile 0? 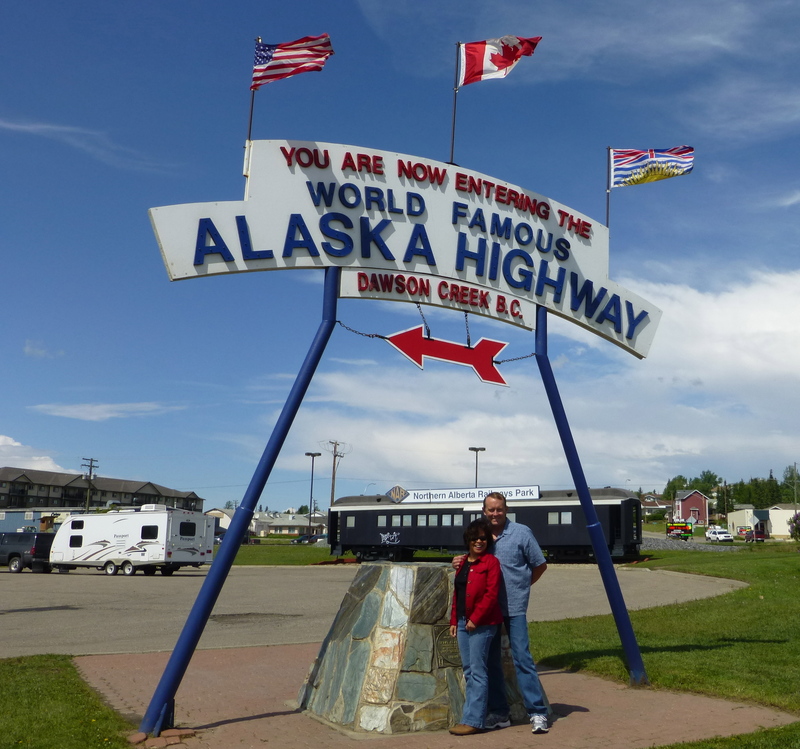 Dawson Creek is famous for being located at Mile 0 of the Alaska Highway, where it begins and ends in Delta Junction, Alaska. The Mile 0 cairn is the exact spot that the U.S. military surveyed as the starting point for the construction of the Alaska Highway. 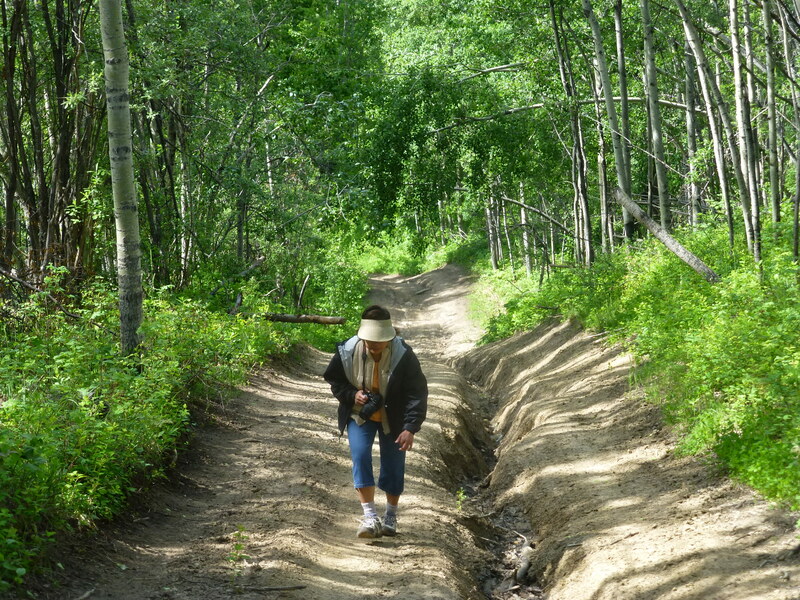 All mileages on the Alaska Highway were and still are measured from this actual spot. 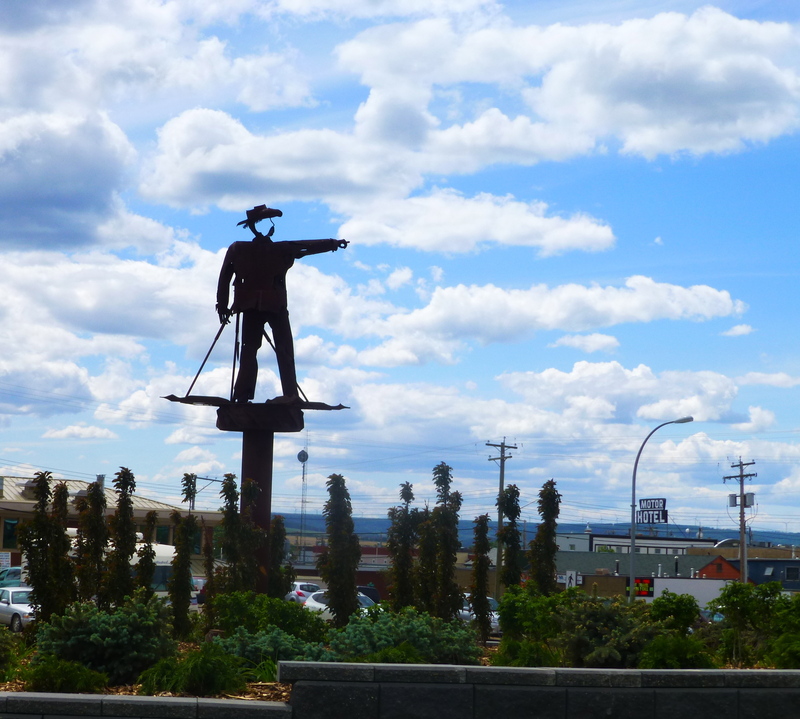 A scrap iron sculpture of a surveyor pointing the way to Alaska. OK, off we go! We strolled around the city’s downtown to get a flavor of its historical past. Next we dropped by the Alaska Highway House to learn how the history of the highway unfolded. It was quite an epic tale of hardship. The original Alaska Highway consisted of 1,528 miles and was completed in just eight months on Nov 20, 1942. Seeing the movie/documentary made us appreciate the incredibly hard work and hardship of the men who built it. 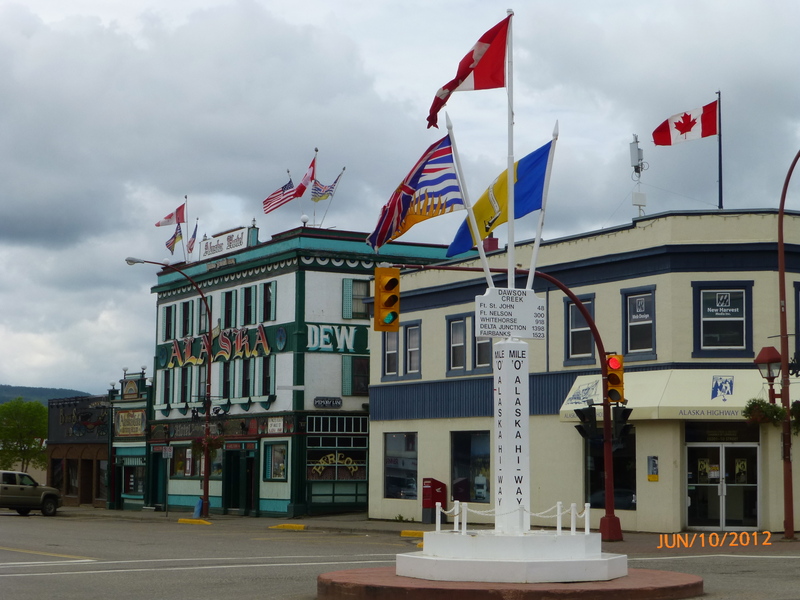 Also in the downtown area was the post that symbolized designation of Mile 0 of the Alaska Highway. We intended to visit here for just a couple of nights, but because of torrential rains up north in the Yukon territory, a portion of the highway had been washed out. So we extended our stay for several days to explore more of the city and the surrounding area, while waiting for the road to get fixed. Just part of the adventure! We also took this opportunity to do some small maintenance and preparation projects on Betsy and the car, to make them ready for the challenging trip ahead. The park was quite packed, as everyone was waiting for news that the highway ahead had been repaired and reopened. We mingled and made friends with our neighbors, exchanging stories and plans about our upcoming adventures. 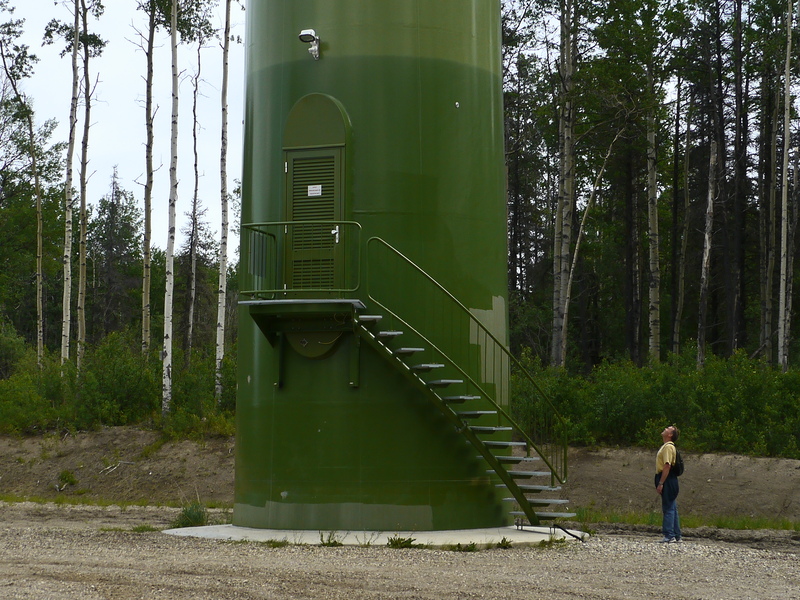 To kill some time while at Dawson Creek, we drove out of town and explored the Bear Mountain Wind Farm, which is a 30-minute gravel-road drive. 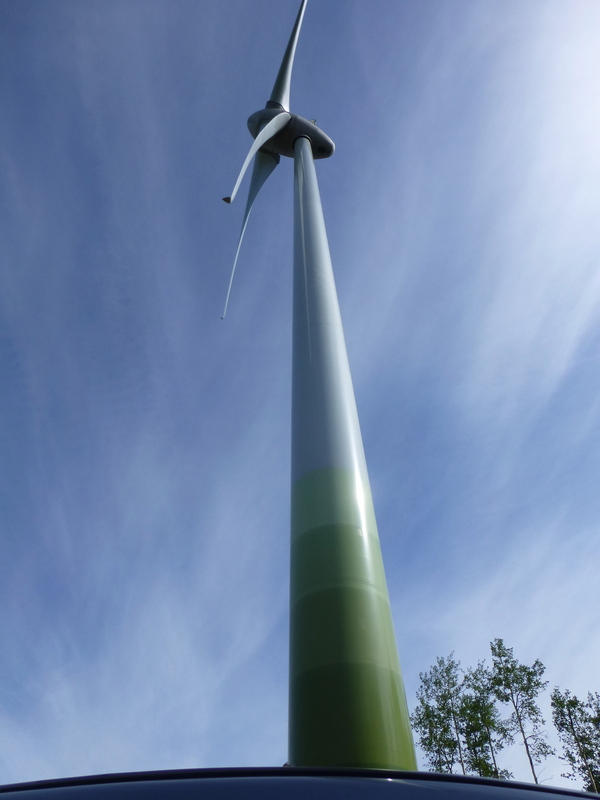 There were 34 wind turbines on the farm, each weighing 236 tons and standing 256 feet tall. 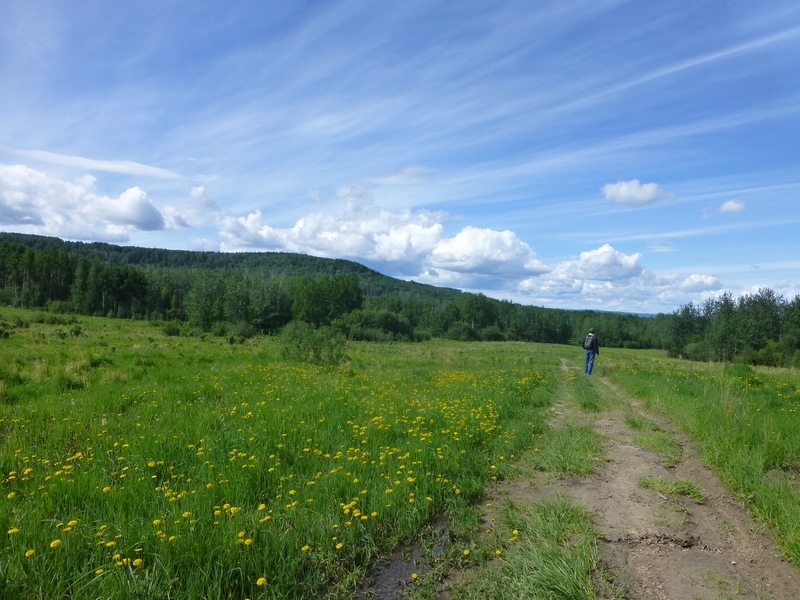 At the base of turbine #34 was a trail that lead out to a meadow. In Tracy, CA where we used to live, there were hundreds of wind turbines adorning the Altamont Pass just a few miles away. We came to this farm to hike and enjoy the view that our hometown turbines can’t match. After hiking down to the meadow, we stopped for a quick lunch. 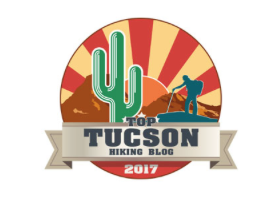 We rate this trail as “strenuous”, since the climb up/down was every bit as steep as the one to Vernal Falls in Yosemite. When we got back to the trailhead an hour later, we saw another trail which led to the rim of the rocks and offered spectacular views west to the Rocky Mountains. 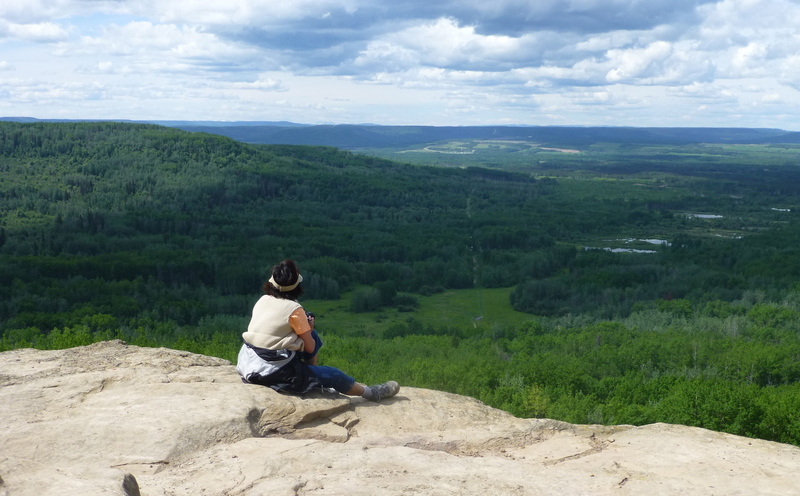 We did not encounter any wildlife, but the views were amazing. 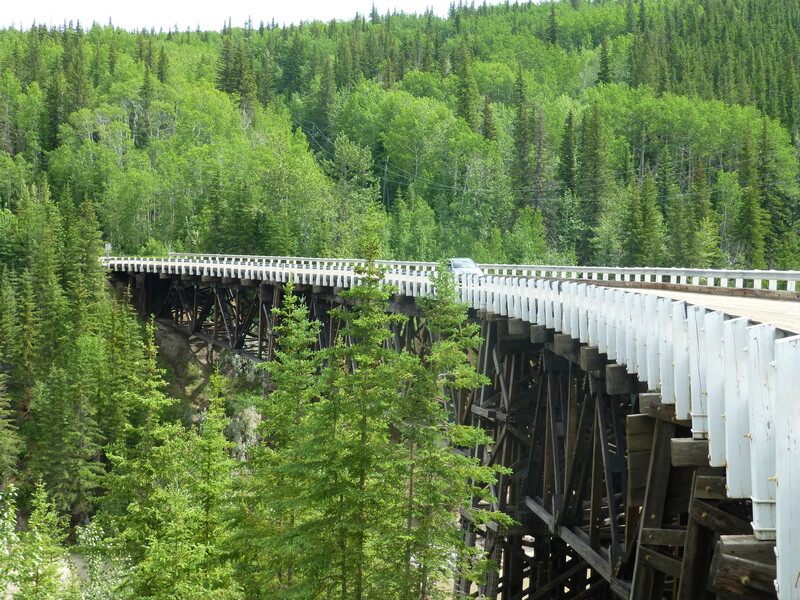 Next we drove north to check out the the only remaining wooden bridge on the Alaska Highway. The Kiskatinaw bridge, at 534 ft. long, is sloped and has a 9-degree curve to conform with a bend in the highway. Historic curved wooden bridge and the only original Alaska Highway bridge still in use. Pay a dollar for using the shopping cart and get reimbursed afterward. Some places charge for plastic bags, too. After four days of waiting, the road finally reopened with limited traffic and warnings to expect long delays. Most of our neighbors left, but we decided to hang out another day to avoid the rush of RVs and trucks going in and out of Alaska. 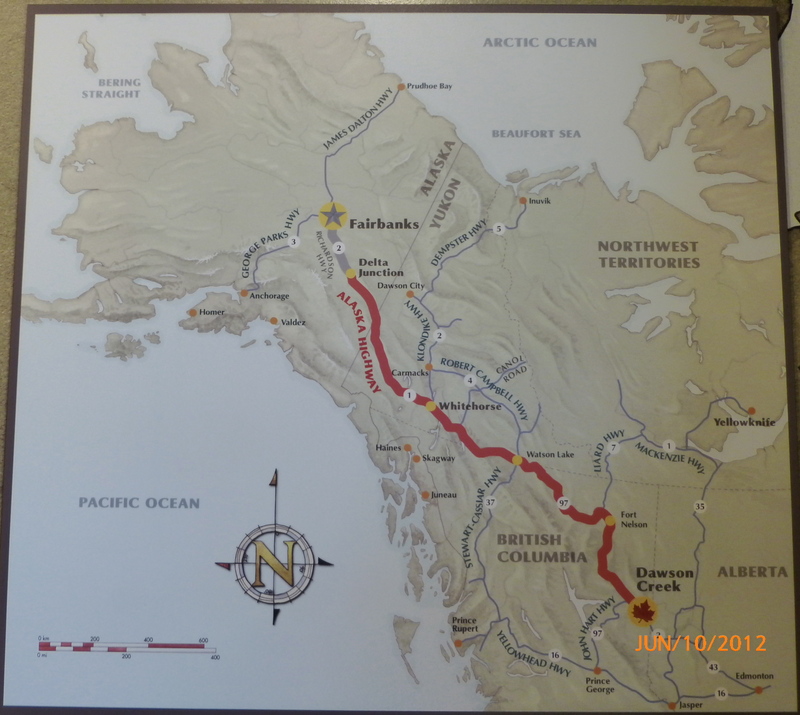 We will be leaving on the 15th and pick up the pace a bit until we arrive at our next milestone stop, Whitehorse in the Yukon territory. Diesel fuel is about a dollar more per gallon than in the USA. Blinking green lights warn of pedestrians crossing ahead. The sun rises at 5:43AM and sets at 10:46pm right now, long days are ahead! A six pack of beer costs $12.00-$15.00, and we had to go to a liquor store to get it – grocery stores do not sell alcohol here. 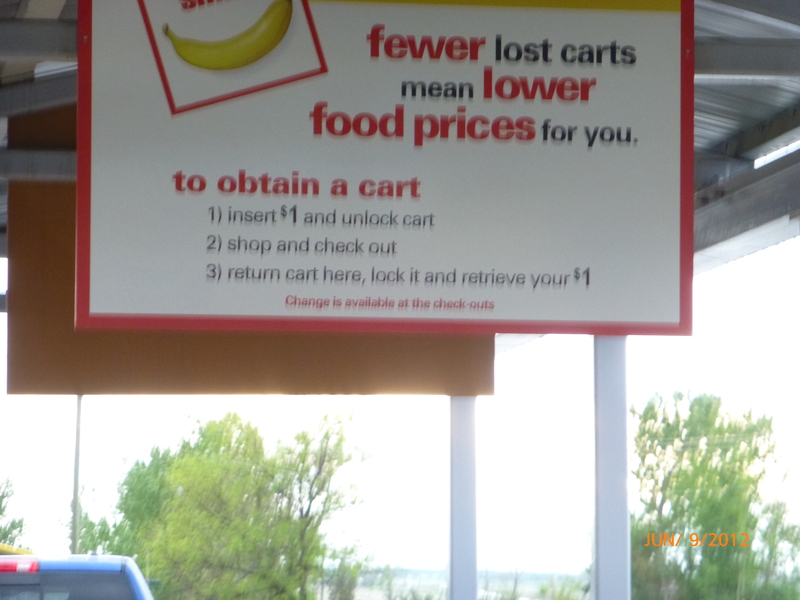 You pay $1.00 to use a shopping cart, but get reimbursed when you return it. Be ready to cough up 5 cents for each plastic grocery bag if you don’t bring our own reusable bags. Welcome to Dawson Creek! A little delay offered you the opportunity to see some of the most interesting things DC has to offer. I always bring our guests out to the curved wooden bridge. Safe travels to you! Yes it did present more days to discover DC. Congratulations for “Living Your Dream”. I hope it’s everything and more than you expected. Very happy for you. Thanks, challenges are still ahead of us but we will press on.